and provide maximum 1000mA charging current per port. It is equipped with over-voltage and over-current protection to ensure safety. 1.USB Port x 20 - Data hot sync and charge up to 20 different devices (iPhone / iPad / Smartphone / DC /MP3 / MP4 / PSP and other devices) at the same time. 2.Each port provide 5V/1A USB power output. 4.Built-in overvoltage / overcurrent protection module. Compatible operating system: Windows XP/Vista / 7/8; Mac OS. Linux. 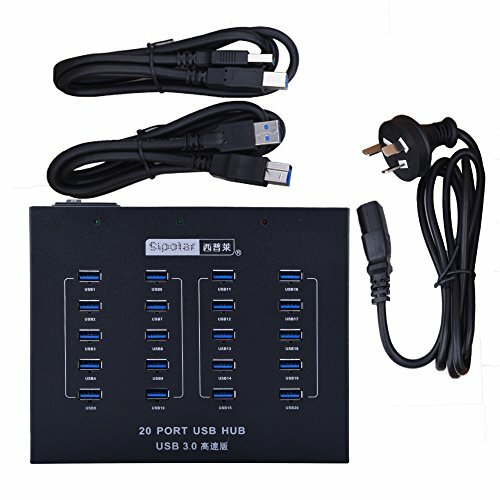 The drive installation is automatic and no need software.Just connect the USB hub with your PC,and then you can connect any USB devices with the 20 USB 3.0 ports. Industrial grade whole solid aluminum shell, high safety and reliability extend the working life. Excellent cooling efficiency. Solid black aluminum frame, make the products durable for a long time. All ports on one side, to make clean your desk, and save your space. The mounting bracket allows you to fix the product. With some entilation holes, the hub never gets hot.And the built-in 5V 20A WEAN WELL (International brand) power adapter with UL certification to keep the safe charges.And you can choose the voltage with your country's standard. What You Get: Sipolar 100W USB 3.0 20-Port Data Hub and Smart Charging Ports,two USB 3.0 A - B Cables, mounting ears,power cord,our fan-favorite 12-month warranty and friendly customer service. Manufacturer: Shenzhen Lpsen Technology Co., Ltd. Publisher: Shenzhen Lpsen Technology Co., Ltd. Studio: Shenzhen Lpsen Technology Co., Ltd. If you have any questions about this product by Sipolar, contact us by completing and submitting the form below. If you are looking for a specif part number, please include it with your message.